A cactus in bloom in the Pisgah Valley of the central Mojave Desert. This cactus and the ecologically important desert habitat here would be destroyed by bulldozers if K Road Power begins construction of the Calico Solar power project. The solar facility would destroy nearly 7 square miles of desert. The Sierra Club, Defenders of Wildlife, and NRDC have filed a legal challenge, suggesting the project should be built on already-disturbed lands. Despite opposition from the BNSF railroad, conservation groups, and countless concerned citizens, K Road Solar is still intent on building the Calico Solar power project in the central Mojave Desert. But first they will need to complete a supplemental environmental impact analysis. An environmental impact statement was actually completed last year and the project approved, but the project plans were sold to K Road Solar, which then modified them enough to warrant additional impact analysis. The California Energy Commission (CEC) on 3 October held a hearing to consider whether K Road Solar's planned Calico Solar project would have its permit revoked. At issue is the 2010 decision by the CEC to permit the project even though Tessera Solar LLC -- the project developer at the time -- told the commission it planned to build the project with 26,000 Suncatchers, a solar technology that was owned by Stirling Energy Systems in the infant stages. 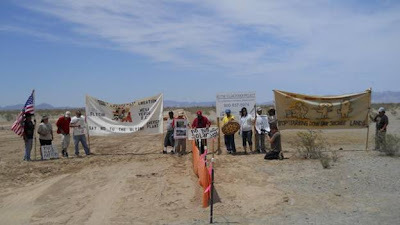 Well, the CEC permitted the project even though some people argued that the technology was unreliable and inefficient, and that the project would destroy essential desert habitat. Last month I wrote about the Calico Solar power project because the Bureau of Land Management (BLM) granted Tessera Solar LLC permission to build a solar facility on pristine desert that Tessera never had the capacity to build in the first place, according to information put forward in legal proceedings. Tessera Solar then sold its permission to build on 7 square miles of public land--called a "right-of-way" grant (ROW)--to a company called K Road Sun. The BLM now considers the Calico Solar ROW to be "inoperative," and will not allow construction to proceed on the pristine desert until a new environmental analysis is completed, according to information provided by the BLM to the US District Court on 6 June. 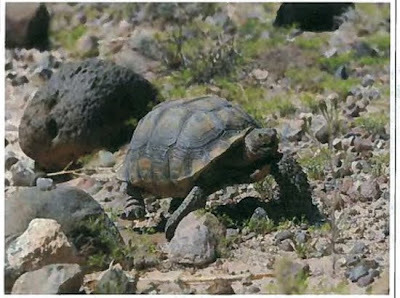 "We anticipate that construction of the [Ivanpah] project site is likely to take, in the form of mortality or injury, between 405 and 1136 desert tortoises... We anticipate that the vast majority of these will be individuals of smaller size or desert tortoise eggs that are difficult to detect during clearance surveys and construction monitoring; therefore, we are unlikely to find carcasses of these individuals." 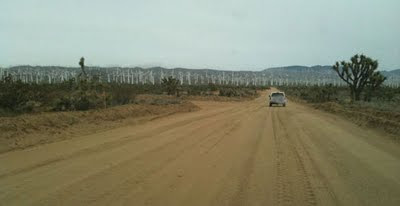 The Sierra Club asked the California Energy Commission (CEC) to halt its review of K Road Sun's revised proposal to build the Calico Solar power project, but the CEC dismissed the Club's challenge. The project will destroy nearly 7 square miles of pristine desert on public land, and displace or kill many rare plant and wildlife species. As I mentioned in a previous post, the CEC permitted the Calico Solar power project under a different owner last year, even though that company did not even have the financial or technical ability to build the project. The new company, K Road Sun, is also of dubious pedigree, and is rushing the CEC for approval so that it can receive loans and grants from the taxpayer. Have We Been Fooled by Calico Solar? This is the story of a solar power project that was approved by State and Federal Governments even though the energy company had no way of building it in the first place. The representatives of the taxpayer are now being asked to turn a blind eye, once again. 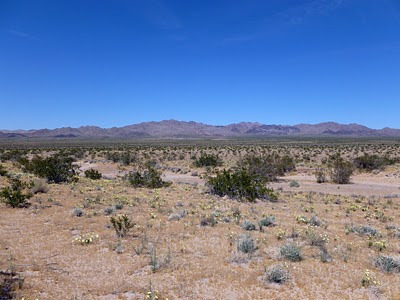 Last fall the California Energy Commission (CEC) and Department of Interior approved Tessera Solar LLC's proposal to bulldoze 7 square-miles of public land for a solar power facility in the central Mojave Desert. 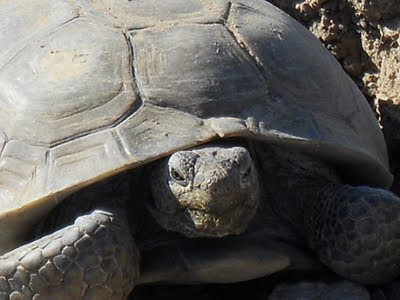 Both Washington and Sacramento acknowledged the significant environmental damage the project would cause to the pristine desert habitat, but rushed to approve it so Tessera Solar could qualify for over a billion dollars in taxpayer-backed stimulus funding. The government approved the project on the basis that Tessera Solar would install thousands of SunCatcher dishes--an unproven and complicated piece of machinery. One thousand square miles. That's how much public land energy companies want to bulldoze over the next few years in California for massive solar and wind facilities, according to the Bureau of Land Management (BLM) list of pending and approved wind testing and solar applications. That is more than two times the size of Los Angeles, over four times the size of San Francisco, and more than 14 times the size of Washington D.C. But what would 1,000 square miles of solar and wind projects get us? Will it stop climate change? Not nearly. The proposed projects would generate 13.7 gigawatts of energy. That is less than a quarter of California's total energy generation capacity. Building fields of glass and metal the size of the cities they are meant to power does not make sense. 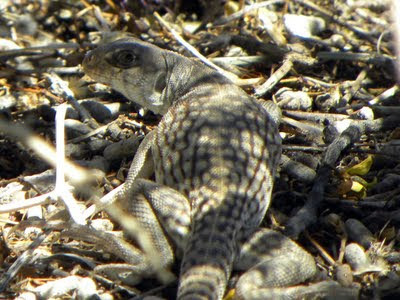 A desert iguana on the site of the proposed Calico Solar power project in the central Mojave Desert, peering back at the photographer from the shade of a creosote shrub. 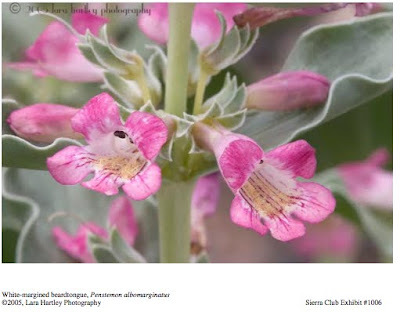 The habitat on the site is pristine, and hosts desert tortoise, a rare desert flowering plant known as white-margined beardtongue, and the threatened Mojave fringe-toed lizard. 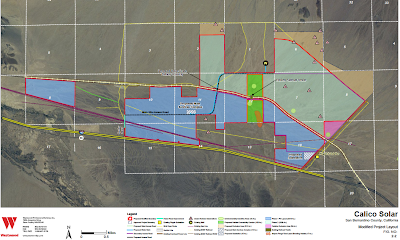 The Calico Solar power project would be built by K Road Power, pending re-evaluation of environmental impacts by the Bureau of Land Management and California Energy Commission due to modifications made to the proposal. The California Supreme Court this month denied a petition by the Sierra Club that challenged the California Energy Commission's (CEC) inadequate environmental review for the Calico Solar power project. A similar legal challenge by California Unions for Reliable Energy (CURE) was also thrown out by the court. The Calico Solar power project was initially proposed by Tessera Solar LLC and approved by the CEC and Department of Interior last year. Tessera Solar has since sold the project rights to K Road Power (aka K Road Solar), which is proposing to modify the 7.2 square mile project to use more photovoltaic panels to supplement Tessera Solar's disastrous SunCatchers.